...Our Christmases together were simple. We limited our gifts to pennies and wits and all-out competition. Who would come up with the most outrageous for the least? The real Christmas was for the children, an idea I found totally compatible, for I had long ago ceased to speculate on the meaning of Christmas as anything other than a day for children. Christmas to me was only a memory of old loves and empty rooms, something I buried with the past that underwent a vague, aching resurrection every year. One Christmas, though, was different. I was lucky. I had the whole day off, and I spent Christmas Eve with them. When morning came, I awoke to a small hand kneading my face. "Dup," was all its owner had time to say. I got downstairs just in time to see the little boys' faces as they beheld the pocket rockets and space equipment Santa Claus had left them. At first, their fingers went almost timidly over their toys. When their inspection had been completed, the two boys dragged everything into the center of the living room. Bedlam prevailed until they discovered there was more. As their father began distributing gifts, I grinned to myself, wondering how my exceptionally wily unearthments this year would be received. His was a print of a portrait of Sydney Smith I'd found for thirty-five cents; hers was the complete works of Margot Asquith, the result of a year's patient search. The children were in agonies of indecision over which package to open next, and as I waited, I noticed that while a small stack of present mounted beside their mother's chair, I had received not a single one. My disappointment was growing steadily, but I tried not to show it. They took their time. Finally she said, "We haven't forgotten you. Look on the tree." There was an envelope on the tree, addressed to me. I opened it and read: "You have one year off from your job to write whatever you please. Merry Christmas." "What does this mean?" I asked. "What it says," I was told. They assured me that it was not some sort of joke. They'd had a good year, they said. They'd saved some money and thought it was high time they did something about me. "What do you mean, do something about me?" It was plain to anyone who knew me, they said, if anyone would stop to look. They wanted to show their faith in me the best way they knew how. Whether I ever sold a line was immaterial. They wanted to give me a full, fair chance to learn my craft, free from the harassments of a regular job. Would I accept their gift? There were no strings at all. Please accept, with their love. It took some time to find my voice. When I did, I asked if they were out of their minds. What made them think anything would come of this? They didn't have that kind of money to throw away. A year was a long time. What if the children came down with something horrible? As objection crowded upon objection, each was overruled. "We're all young," they said. "We can cope with whatever happens. If disaster strikes, you can always find a job of some kind. Okay, consider it a loan, then, if you wish. We just want you to accept. Just permit us to believe in you. You must." "It's a fantastic gamble," I murmured. "It's such a great risk." My friend looked around his living room, at his boys, half buried under a pile of bright Christmas wrapping paper. His eyes sparkled as they met his wife's, and they exchanged a glance of what seemed to me insufferable smugness. Then he looked at me and said softly; "No, honey. It's not a risk. It's a sure thing." Outside, snow was falling, an odd event for a New York Christmas. I went to the window, stunned by the day's miracle. Christmas trees blurred softly across the street, and firelight made the children's shadows dance on the wall beside me. A full, fair chance for a new life. Not given me by an act of generosity, but by an act of love. Our faith in you was really all I had heard them say. I would do my best not to fail them. Snow still fell on the pavement below. Brownstone roofs gradually whitened. Lights in distant skyscrapers shone with yellow symbols of a road's lonely end, and as I stood at the window, looking at the lights and the snow, the ache of an old memory left me forever. (To read the entire story, click here. It may take a moment to load). 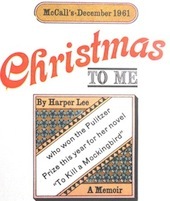 In 1960, after that special Christmas, Harper Lee published her one and only novel, the beloved classic, To Kill a Mockingbird. Isn't it amazing how much joy one gift can bring? Have you ever received (or given) a life-changing gift?